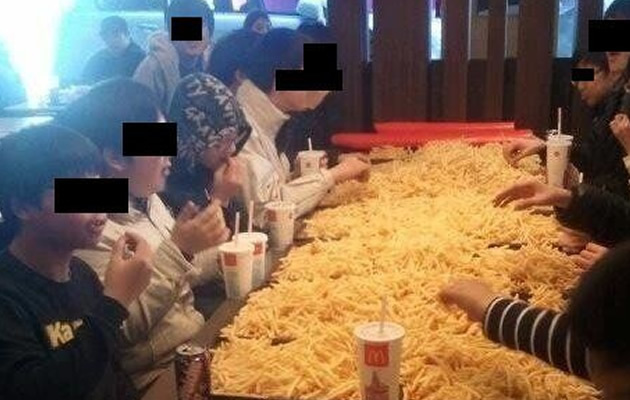 French fry parties the latest junk food fad? 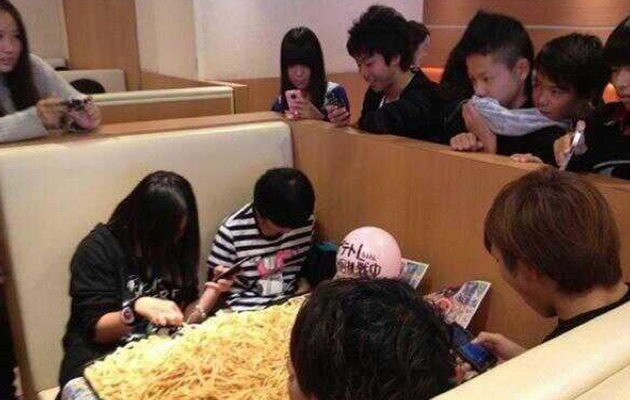 In what could possibly be the most unhealthy fast food trend ever, teens in South Korea and Japan have started throwing 'potato parties', involving vast amounts of deep fried french fries and a strong determination to finish them all. Here's how they throw a potato party - buy excessive amounts of french fries (more than 30 large sized packets seem to be the norm), spread them out in potato 'mountains' across a series of plastic food trays, upload the photos to social media, and spend the next few hours trying finish them all. The trend apparently started in Japan last year during a nation-wide McDonald's promotion where large fries went for 150 yen, or about US$1.60 per pack. A group of teens bought 23 packets and posted the photo on social media, where it promptly went viral and was re-tweeted thousands of times, sparking a 'potato party craze'. The carb-feasting soon spread to South Korea, where a group of youths ordered 270,000 won, or US$250 worth of the fried snack and were scolded by a McDonald's worker, who called them 'brats' and told them to get out of the restaurant. 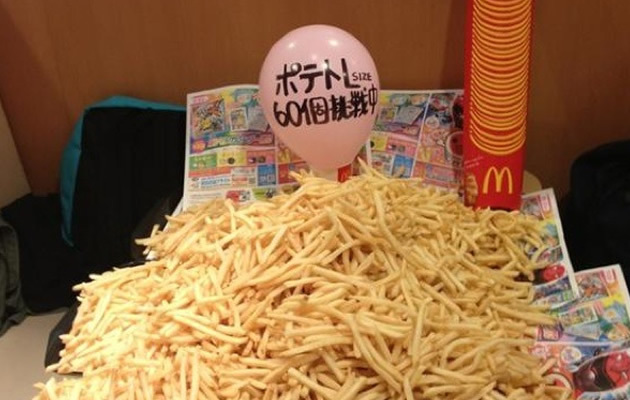 Most recently, a photo of a 60-pack potato party (above) started trending in Japan - complete with a special balloon to commemorate the heart-attack inducing three-hour long occasion. At about 560 calories per large sized packet of fries, that would mean that the four teens would have to consume a whopping 33,000 calories in order to earn their potato party a place in the french fry Hall of Fame. The craze has sparked an equal amount of angry disapproval from parents, restaurant staff, and other customers. Firstly, these obscene sized orders cause every one else's food order to be delayed. Customers in South Korea who want to grab a burger can't get into the restaurants because of the hordes of people gathered around watching the youths chowing down their potatoes. In Japan, accusations of unsanitary behaviour have been attributed to these potato parties, and complaints to put an end to the salty feasts have apparently been pouring in. Wastage is also considered particularly heinous in Japanese culture - leaving the youths with two alternatives: either chow down the entire spread of greasy, salty, fatty fries or get scolded for leaving some behind. Neither result sounds positive. Here in Singapore, where a packet of large fries sets you back by about $2.40, it seems unlikely that teenagers will catch on to this unhealthy trend - but who knows?